Everyone went nuts for this cake at the Allergy Show when ‘The Happy Coeliac‘ kindly offered to make a couple of cakes using our batter mix as we were running out of samples. Sam made the cake using one of her family recipes. The cake was so delish that I could hardly believe it was made using my mix! 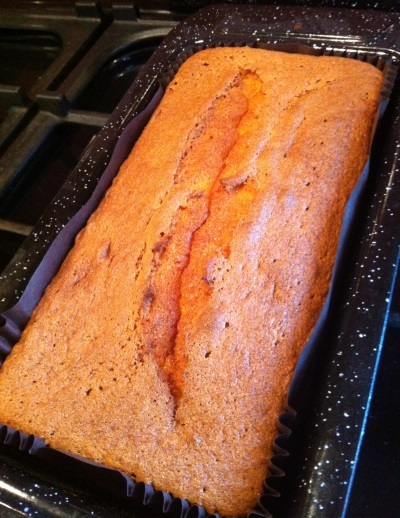 Dairy free too, really light and moist this cake reminds me of a delicious madeira cake. Below is my version of ‘The Happy Coeliac’s’ coconut cake, but please use the link to visit Sam’s website for the original recipe. Cream the sugar, spread and vanilla until fluffy. Add the eggs one at a time, mixing well between each one. Then add the coconut cream to the mixture. Add the baking powder and desiccated coconut to the batter mix flour stirring gently. Then add the flour mix to the egg and sugar mixture and beat gently to start with until all the ingredients are all incorporated well. Place the cake mix into a lined loaf tin and bake for about 40-45 minutes. Check if the cake is cooked by inserting a skewer, which should come out clean. Leave the cake to cool on a wire rack. PS: Sorry I forgotten to take a picture of the cake sliced… it disappeared so quickly!